Why Apple Says It Won't Help Unlock That iPhone, In 5 Key Quotes : The Two-Way A magistrate, at the FBI's request, has ordered Apple to help investigators work around the iPhone's security features. Apple says that's judicial overreach — and a violation of constitutional rights. 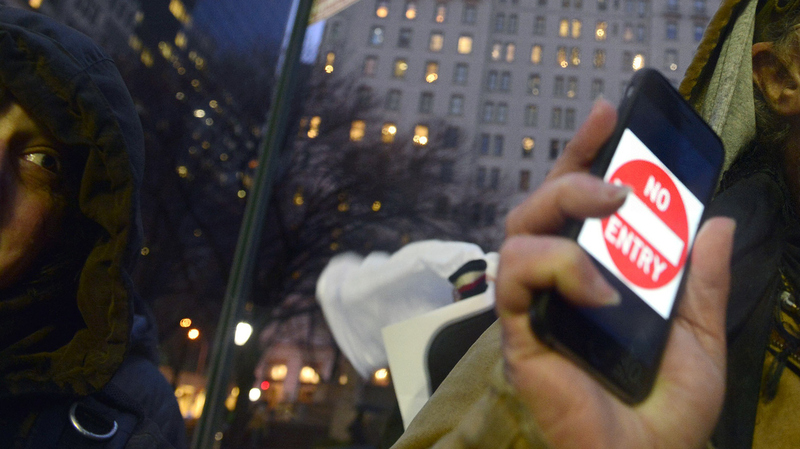 An iPhone user attends a rally at the Apple flagship store in Manhattan on Tuesday to support the company's refusal to help the FBI access an encrypted iPhone. Apple and the FBI are facing off in court over an encrypted iPhone 5C that was used by San Bernardino shooter Syed Rizwan Farook. The phone stopped backing up to the cloud, which the investigators have already searched, several weeks before the Dec. 2 attack. It's unclear what, if anything remains on the phone, but the Justice Department says it has "reason to believe" that Farook used that iPhone to communicate "with some of the very people" he and his wife killed. Apple and the government, however, are at odds over a court order that investigators got to compel Apple to help them circumvent the iPhone's security systems. Right now, the phone is protected by a PIN code that the FBI doesn't know — and trying to guess it could cause the phone's data to be deleted. The FBI wants Apple to write software that would give it unlimited attempts at the PIN with a computer program, but Apple's answer is a hard no. In a motion to dismiss the court's order, filed Thursday, the company says it has cooperated with investigators as much as it can, and this software request is dangerous, illegal and unconstitutional. "The government says: 'Just this once' and 'Just this phone.' But the government knows those statements are not true; indeed the government has filed multiple other applications for similar orders, some of which are pending in other courts. ... If this order is permitted to stand, it will only be a matter of days before some other prosecutor, in some other important case, before some other judge, seeks a similar order using this case as precedent." "... compelling Apple to create software in this case will set a dangerous precedent for conscripting Apple and other technology companies to develop technology to do the government's bidding in untold future criminal investigations. If the government can invoke the All Writs Act to compel Apple to create a special operating system that undermines important security measures on the iPhone, it could argue in future cases that the courts should compel Apple to create a version to track the location of suspects, or secretly use the iPhone's microphone and camera to record sound and video." "[The All Writs Act] does not grant the courts free-wheeling authority to change the substantive law, resolve policy disputes, or exercise new powers that Congress has not afforded them. ... Congress has never authorized judges to compel innocent third parties to provide decryption services to the FBI. Indeed, Congress has expressly withheld that authority in other contexts, and this issue is currently the subject of a raging national policy debate among members of Congress, the President, the FBI Director, and state and local prosecutors." "The All Writs Act does not allow the government to compel a manufacturer's assistance merely because it has placed a good into the stream of commerce. Apple is no more connected to this phone than General Motors is to a company car used by a fraudster on his daily commute. ... Indeed, the government's position has no limits and, if accepted, would eviscerate the 'remoteness' factor entirely, as any company that offers products or services to consumers could be conscripted to assist with an investigation, no matter how attenuated their connection to the criminal activity. This is not, and never has been, the law." "Under well-settled law, computer code is treated as speech within the meaning of the First Amendment," Apple says. Under some conditions, the government can force companies to make statements of various kinds. But Apple argues that in this case, given the uncertain value of what's on the iPhone, the investigators failed to prove a compelling state interest in getting into the device and so lack a constitutional reason to compel Apple to speak — especially when the "speech" (aka code the company would write) is in direct opposition to Apple's public stance in favor of encryption and security.
" ... the government's requested order, by conscripting a private party with an extraordinarily attenuated connection to the crime to do the government's bidding in a way that is statutorily unauthorized, highly burdensome, and contrary to the party's core principles, violates Apple's substantive due process right to be free from 'arbitrary deprivation of [its] liberty by government.' "
And As A Bonus ... A "Shoulda Asked Sooner"
"Unfortunately, the FBI, without consulting Apple or reviewing its public guidance regarding iOS, changed the iCloud password associated with one of the attacker's accounts, foreclosing the possibility of the phone initiating an automatic iCloud back-up of its data to a known Wi-Fi network ...which could have obviated the need to unlock the phone and thus for the extraordinary order the government now seeks. Had the FBI consulted Apple first, this litigation may not have been necessary."